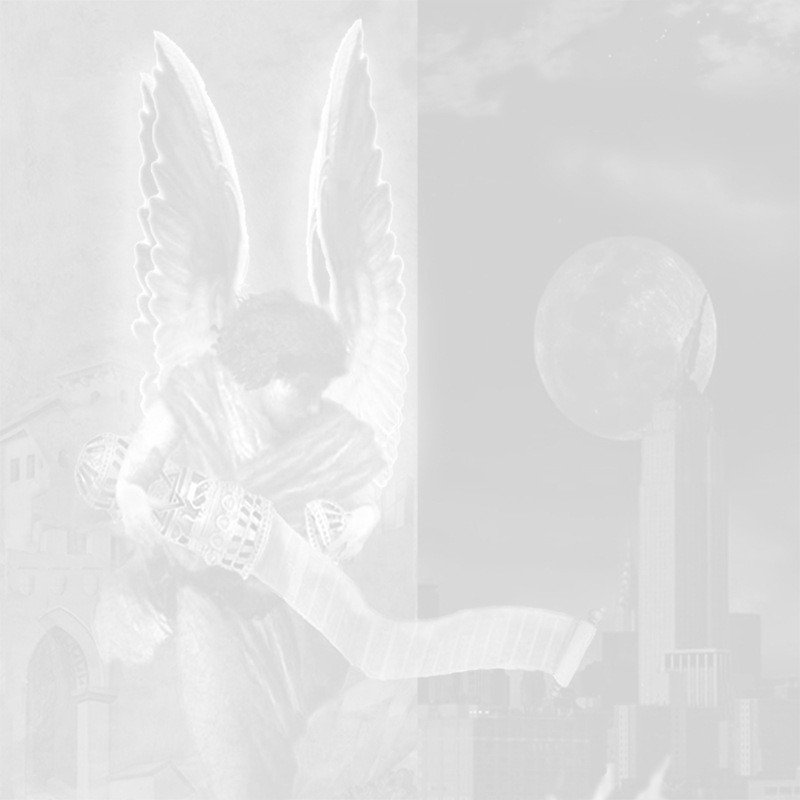 The Book of Enoch Info Website ~ This is your one-stop for Enochan studies! Welcome to the Enoch Info Website! See “The World of Evidence” which supports Enoch's book! Was The Book of the Parables Found in the Dead Sea Scrolls? 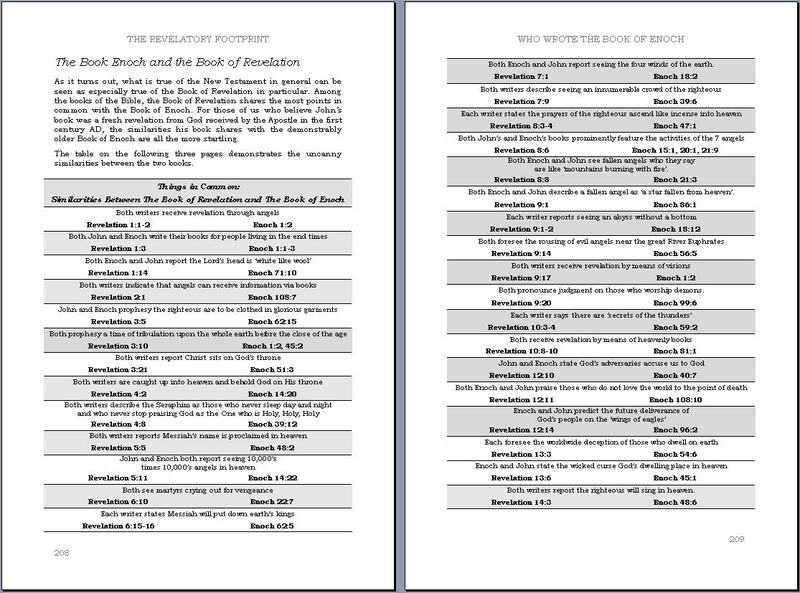 The entire text of the Book of Enoch! 110 pages of evidence that Enoch really wrote this book! 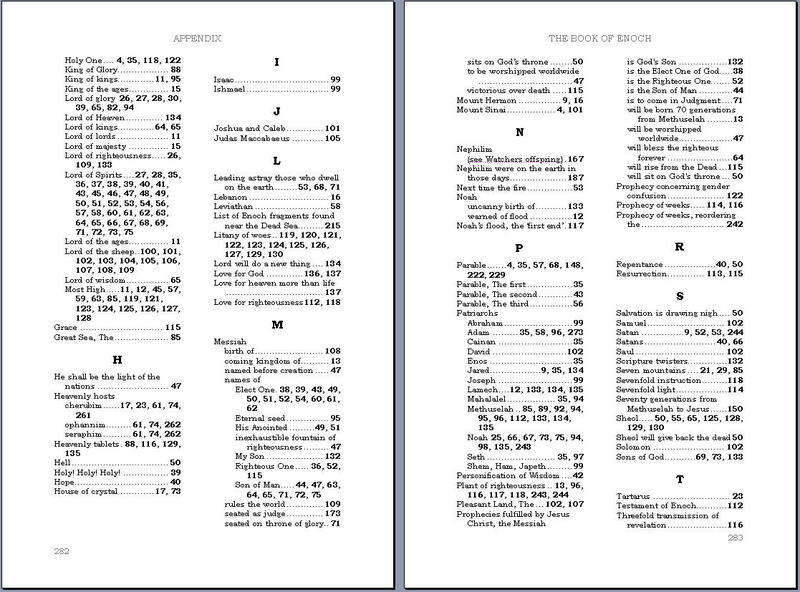 Hundreds of cross-references to the books of the Bible! "Who Really Wrote the Book of Enoch?" 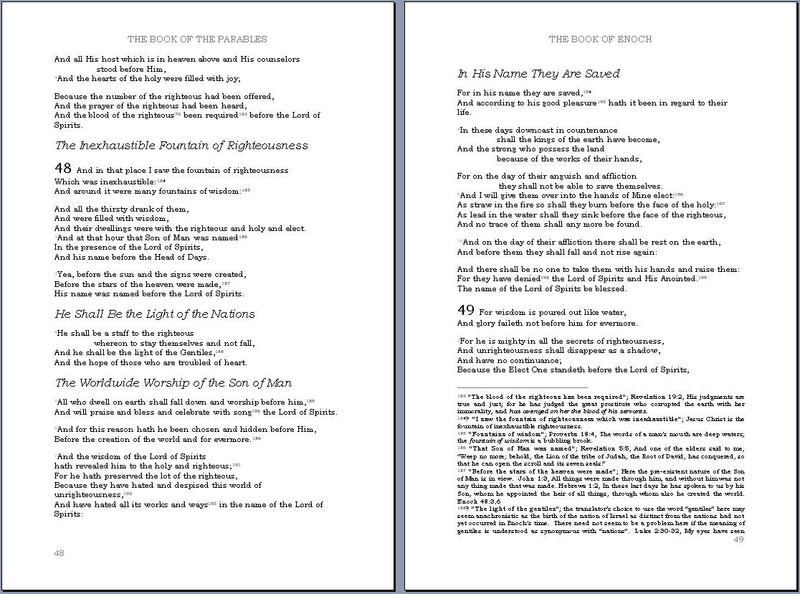 The translation being used for this edition of the Book of Enoch was published a century ago by R. H. Charles. Amazingly, the readability and vivid style of Charles’ translation still holds up after more than a century. Print copies of R. H. Charles original work used Roman numerals for chapters and verses. The use of Roman numerals for chapter and verse numbering has been eliminated here. 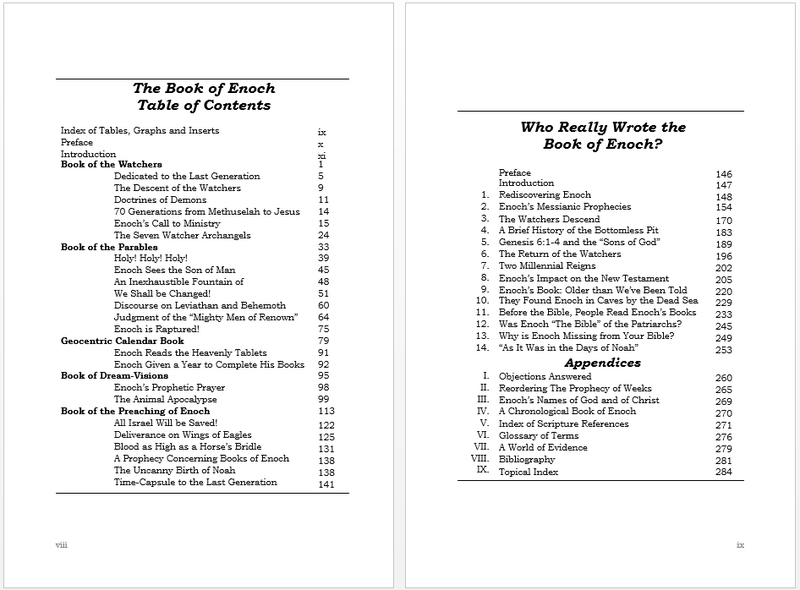 It is hoped the use of traditional numbering of chapters and verses will encourage the use of quotes and passages from the Book of Enoch in books, articles and Biblical studies, and will render this edition a useful reference tool. Readers will no doubt find it easier to refer to Enoch 105:2, rather than Enoch CV:II! Also, the text has been set to single-column-paragraph style to help the reader differentiate between narration, dialogue, and the versified, poetry sections. 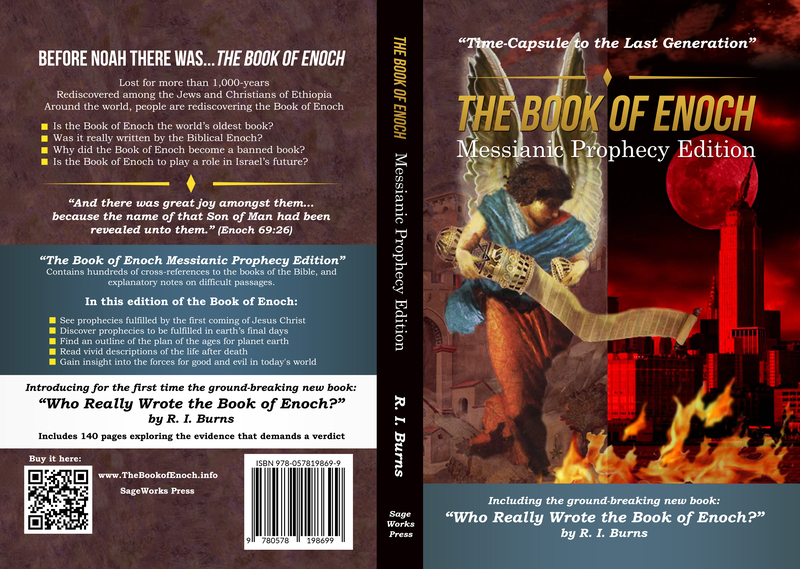 The Book of Enoch Messianic Prophecy Edition, introduced here for the first time, is fully cross-referenced to the Bible. 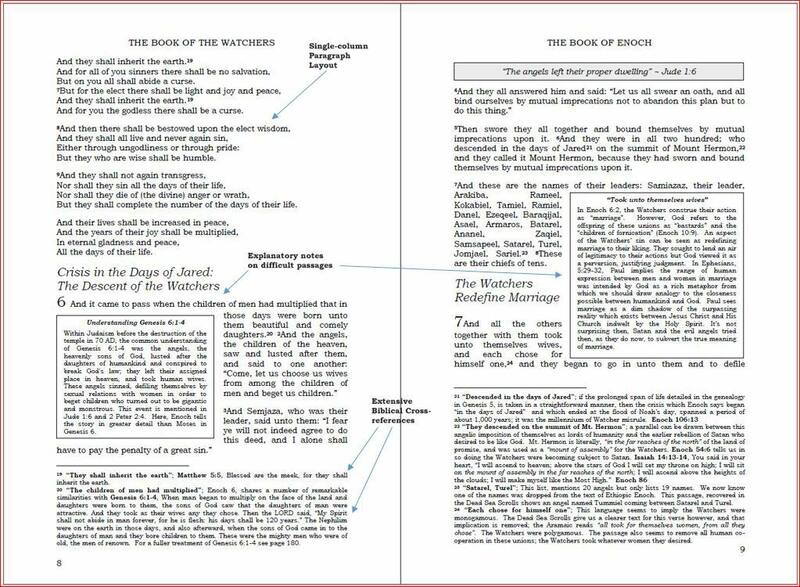 Biblical references are printed fully in the footnotes in order to quickly assist the reader, to see the thoroughly Scriptural character of the Book of Enoch. Explanatory notes are provided for difficult passages. It is hoped the notes, articles, and study aids in this edition, will help the reader to find the Book of Enoch a source of blessing and encouragement. May the Book of Enoch receive its proper recognition as the legacy of Israel and the heritage of the Church so that many may discover its stunning testimony to Jesus Christ, delivered as it was before His first appearing and in anticipation of His return. The Bible tells us precious little about the Biblical figure known as Enoch. In Genesis 5:24, we read, “Enoch walked with God, and he was not, for God took him.” In the Epistle to the Hebrews, it says, “By faith Enoch was taken up so that he should not see death, and he was not found, because God had taken him. Now before he was taken he was commended as having pleased God” (11:5). Finally, in Jude 1:14, we discover, “Enoch, the seventh from Adam, prophesied.” Jude proceeds then to quote a passage from the Book of Enoch. Why would Jude, one of the inspired writers of the New Testament quote from a book not found in our Bible and call it prophecy? Does the Book of Enoch agree with or contradict the Bible? It is hoped this volume will assist the reader to get closer to the answers to these and other questions. The Book of Enoch, is sometimes referred to as 1 Enoch or Ethiopic Enoch, (because the only complete copy of the book in an ancient language is an Ethiopic one). In ancient times the book was referred to as the Book of the Words of Enoch (pp. 234-235). I think a better title than all these might be the Revelation to Enoch or the Apocalypse of Enoch, since that better describes the book’s contents. The Book of Enoch began as a set of smaller books which circulated as independent scrolls. Eventually, these smaller books were combined into The Book of Enoch, which we have today. Despite the composite nature of the Book of Enoch, there is a certain logical arrangement to it. For instance, the first chapter of the first section and the last chapter of the last section share common themes. Consider too, the first chapter opens with a message to the generation who will be living at the end of time, who are said to be alive when God comes to tread upon the earth. It is Jude who interprets this vision for us. Jude says this passage should be understood not just as poetic imagery but as a vivid vision of God coming to earth as Messiah at the Second-coming of Jesus Christ. 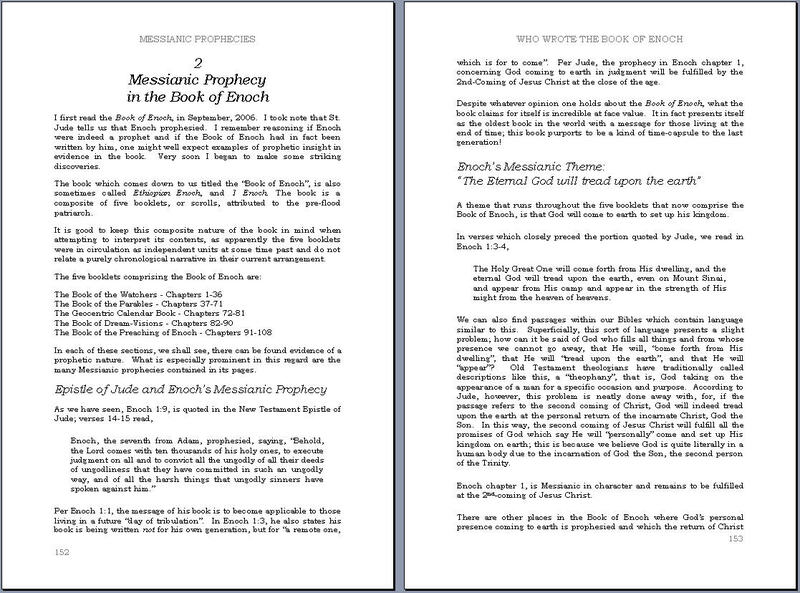 The Book of Enoch Messianic Prophecy Edition, is presented here as a study edition of the Book of Enoch. For the purposes of this edition, it is assumed the Book of Enoch is the legitimate writings of the Biblical Enoch. For a detailed defense of this position, the book, “Who Really Wrote the Book of Enoch?” is being introduced in print here for the first time. 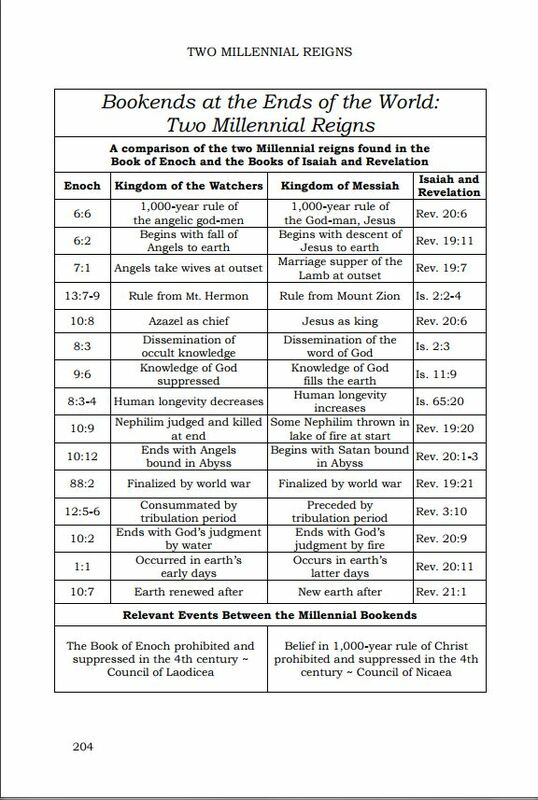 There, detailed evidence is brought forth to the reader, arguing the Book of Enoch is indeed the authentic writing of the Biblical Enoch. In the Book of Enoch Messianic Prophecy Edition, passages which are believed to contain messianic prophecies have been marked with a “✡” symbol. This symbol indicates a footnote is included which shows how the passage can be understood Messianically. copyright © 2006, 2017 R. I. Burns. All rights reserved including print and electronic versions.